White, Becky. 2011. Betsy Ross. Illus Megan Lloyd. NY: Holiday House. ISBN: 9780823419081. You open and read. Read, read. You grin. Grin, grin. Becky White's simple rhyming poem is an excellent book on a not-so-common story: the story of Betsy Ross sewing the first American flag. White captures the method of creating the flag with snip, snip and a rib, rib and straight to indigo dye drip, dripping. Those who are familiar with the American flag will soon enough know what Betsy is sewing toward the end of the book. Lloyd's quilted illustrations are wonderfully fitting. Using fabric and embroidery floss every image is handmade and matches the clean poem. End notes from the author and illustrator are found in the back with the instructions on how to cut a star from fabric the way Betsy Ross would have done. A title to include in any collection, but especially for a Fourth of July collection that needs a boost in great story books for young readers. All in all, a perfect book. Provide scraps of fabric and have the children try making their own Betsy Ross star. For older children, have them sew their own flag out of scraps of fabric by hand. For a poetry break, read this book! Who knew pancakes would be such an awesome success! As a storytime theme, I mean. Yes, a storytime theme! Sometimes I have the concern that a new theme won't go over well with the children, especially if there aren't a lot of books to choose from, especially for a certain age group. Well, one of the greatest things about storytime is that isn't always about the books you read. It can be about the activities and flannel boards that you can do! Both my Toddler and Preschool storytime were so well received that I deem this theme perfect! Take that any naysayers! This books isn't entirely about pancakes, but its about round things, which is a great shape concept to introduce to toddlers. Almost very instructional in nature, but is a Easy Reader perfect for storytime nonetheless. There are cute little mice that help the chef make the pancakes so make sure to point them out. You can also emphasize the tall stack of delicious pancakes that was made and how the chef ate them all! Oy! A great take on "The Little Red Hen". The children thought it was funny when he tried to read a book that was upside down, and agreed how all his neighbors were rude! Everyone thought it was funny when he ate his neighbors then his pancakes! Sorry gave the plot away! How can you not read this book??? Before doing the rhyme I handed out little felt circles to each of the children. Moved our hips and arms when mixing and stirring, then we made our palm flat to make a pan to keep the circle on. Then when it was time to say "Catch 'em if you can" we all had to toss up our circles like pancakes and see if we could catch them. Toddlers and preschoolers LOVED it!!!!!! I used a large circle and a separate narrow rectangle to make a frying pan. Then I used five medium circles to make pancakes. I had the children one by one take a pancake off the board, which is a fun twist from the often activity of putting something on the board. The toddlers got to clue a brown circle to a paper plate and glue blueberry, strawberry and banana toppings. Any Children's Librarian knows that you cannot be without egg shakers. I always have them on hand in my storytime room. Today I used them because I tied them into my pancake breakfast theme. The children love them! Remember to shake toward the sky, then down low by the toes, behind your back, by your tummy, from side to side, really loud and fast then really slow and quiet. Repeat as long as you want! After doing the Five Crispy Pancakes rhyme, I removed the frying pans handle, which is why I made sure the elements were separated, and the large circle becomes a plate! Genius, I know. The children had to put the pancakes back on the plate, and I handed out felt shapes that were blueberries, strawberries, bananas, pats of butter and splotches of syrup. One by one they had to put their fruit, butter and syrup on the pancakes! They loved it! I added a egg and bacon to the Preschool Storytime fun by asking, "What else can you eat with pancakes?". Topped off pancakes from each of the programs! All the kids were budding chefs! created by Dorothy, WP-CC 2012. Elephants. Can't go wrong, right? They are truly one of my favorite animals. Believe it or not, when I was planning an elephant storytime in fall 2011, I had a little difficulty finding inspiration. However, the end result was so much fun, and I love my Special Activity and so did everyone else! Ask the children what color is on each page. I shared the pictures but didn't read the text, but emphasized that elephants and children can do the same thing! It was fun to ask the children if they knew how to catch an elephant and what did elephants liked to eat. You should read this dramatically! 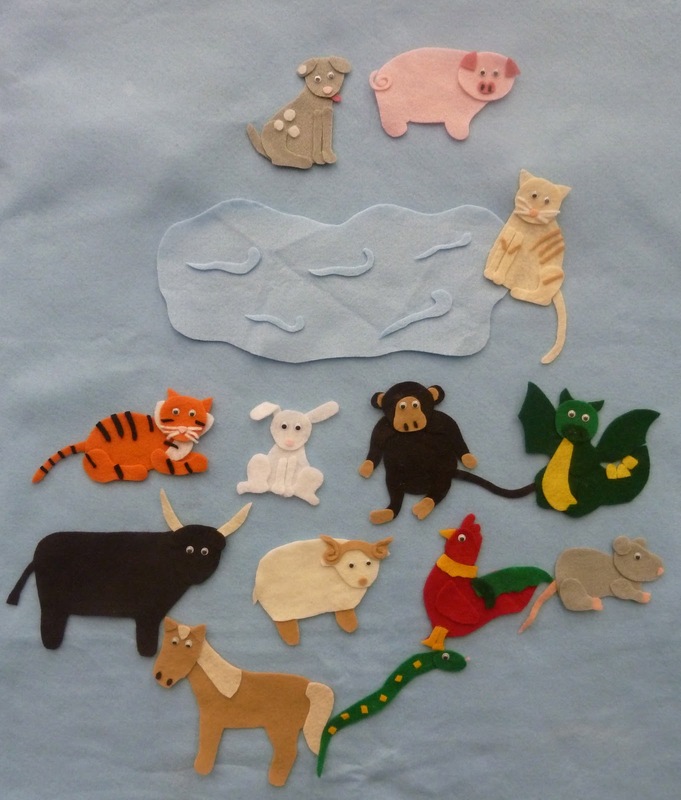 Each set was made with different color construction paper as it was inspired by I Dream of an Elephant book. The ears were so large and flappy even my boss thought they were a cute colorful herd! A kit of all the items needed to catch and elephant printed on cardstock and can be placed in a construction paper folded suitcase. I even had a wonderful dad draw and color a tiny little elephant for his daughter to put into her kit. Awesome! I showed an amazingly adorable video of newborn elephant Kenzi from the St. Louis Zoo. I remember seeing her daddy, Raja, when he came out to visit the public! The video can be viewed on YouTube here or below! I just :: love :: the music. It's perfect! Such a lovely set of animals, no? it's snapped and stretched by the crocodile! How fun is it to just play around with farm animals?! Loads! I mean it! I've done a farm storytime for all ages a number of times over the years, and it never, never, ever gets old for me. There are so many good books out there to begin with, but the general concept of animal noises and the fun nature of it all makes this theme a classic! For Baby Storytime, have the guardian gently bounce the baby on their laps while we "clip-clop". For Toddler Storytime have the children clap their hands or pat their knees to the different speeds. One of my favorite books! It's so fun that you can't help but sing it! This book is really funny, especially if you can get the children to go "z-z-zoink!" with you! Children got to glue images of animals behind the flap doors of a barn that I created via a die cut. If you don't have die cut then you can find any image of a barn and cut open the door and windows easy enough with some scissors. BINGO flannel board created by Dorothy, WP-CC 2012. Used the hands to help everyone know when it's time to clap! We celebrated the Lunar New Year in storytime this week! For a "special holiday" type theme this is one that has a good number of books that work, which is exciting! A huge recommendation for Lunar New Year storytimes is to incorporate that year's zodiac animal into the stories, which is what I did for 2012, the Year of the Dragon. Here's what we did! This book was great for the children to call out the different colors! A great counting book that is for celebrating the Vietnamese lunar new year. I recommend this book for a Preschool Storytime that has some older preschoolers than younger. Five little firecrackers standing in a row. In addition to the fire crackers I added little yellow starbursts that I had the children place on each firecracker when it goes boom! Even the shy ones eventually wanted to do it! This was my favorite part of the program. Check out my flannel board for it below! Let them color to their hearts content and let them glue on bits of cotton balls for puffs of dragon smoke! Any dragon image would work; however, for toddlers, I picked Activity Village's dragon since it was super cute! (Activity Village link will open as a PDF). These were easy folded sheets of construction paper with fun embellishments (eyelashes, googly eyes, teeth, and tongues). This was inspired by Craft Ideas for All. Here are the pictures of my flannel board! If you're looking for more ideas for Lunar New Year, in 2010, I shared red envelopes containing stickers that looked like coins as a way to tie into the story of lucky money. Need more Lunar New Year book recommendations? Check out my short bibliography post! 2012 Youth Media Awards Announced! Dead End of Norvelt written by Jack Gantos. NY: Farrar, Straus, Giroux. Inside Out and Back Again written by Thanhha Lai. 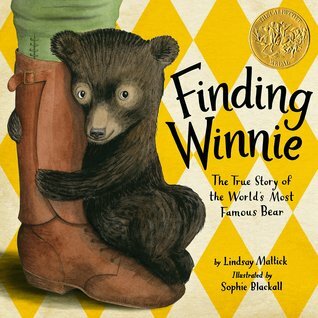 NY: HarperCollins Children's Books. Breaking Stalin's Nose written by Eugne Yelchin. NY: Henry Holt and Company, LLC. A Ball for Daisy written and illus. by Chris Raschka. NY: Schwartz & Wade Books. Blackout written and illus. by John Rocco. NY: Disney (Hyperion Books) Rocco's book is also on the 2012 Texas 2x2 Reading List! Grandpa Green written and illus. by Lane Smith. NY: Roaring Books Press. Me... Jane written and illus. by Patrick McDonnell. NY: Little Brown and Company. McDonnell's book is also on the 2012 Texas 2x2 Reading List! Where Things Come Back written by John Corey Whaley. NY: Atheneum Books for Young Readers. Why We Broke Up written by Daniel Handler and art by Maira Kalman. NY: Little, Brown, and Company, LLC. The Returning written by Christine Hinwood. NY: Dial Books. Jasper Jones written by Craig Silvey. NY: Alfred A. Knopf. The Scorpio Races writteny by Maggie Stiefvater. NY: Scholastic Press. Heart and Soul: The Story of America and African Americans written and illus. by Kadir Nelson. NY: Blazer + Bray). The Great Migration: Journey to the North written by Eloise Greenfield and illus. by Jan Spivey Gilchrist. NY: Schwartz & Wade Books. Underground: Finding the Light to Freedom written and illus. by Shane W. Evans. NY: Roaring Book Press. close to famous written by Joan Bauer. NY: Viking. Wonderstruck: A Novel in Words and Picture written and illus. by Brian Selznick. NY: Scholastics Press. 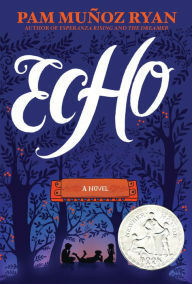 Selznick's book is also on the 2012 Texas Bluebonnet Award Master List! The Running Dream written by Wendelin Van Draanen. NY: Alfred A. Knopf. Note: There is an Schneider Award for Children's Books; however, the jury decided to not vote on a winning book due to none of the submissions were deemed worthy of the award. Soldier Bear written by Bib Dumon Tak and illus. by Philip Hopman. Translation by Laura Watkinson. Grand Rapids, MI: Eerdmans Books for Young Readers. Original language: Dutch. The Lily Pond written by Annika Thor. Translated by Linda Schenck. NY: Delacorte Press. Original language: Swedish. Under the Mesquite written by Guadalupe Garcia McCall. NY: Lee and Low Books, Inc.
Hurricane Dancers: The First Caribbean Pirate Shipwreck written by Margarita Engle. NY: Henry Holt and Company, LLC. Maximilian and the Mystery of the Guardian Angel: A Bilingual Lucha Libre Thriller written by Xavier Garz. El Paso, TX: Cinco Puntos Press. Diego Rivera: His Words and Ours written and illus. by Duncan Tonatiuh. 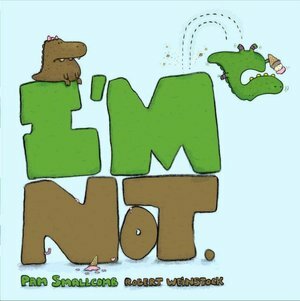 NY: Abrams Books for Young Readers. The Cazuela that the Farm Maiden Stirred written by Samantha R. Vamos and illus. by Rafael Lopez. Watertown, MA: Charlesbridge. 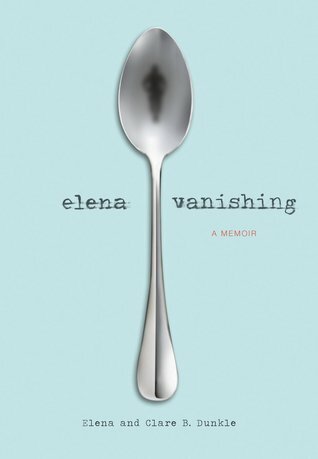 Vamos' book is also on the 2012 Texas 2x2 Reading List! Mariso McDonald Doesn't Match / Mariso McDonald no combina written by Monica and illus. Sara Palacios. NY: Lee and Low Books, Inc.
Tales for Very Picky Eaters written and illus. by Josh Schneider. NY: Clarion Books. I Broke My Trunk written and illus. by Mo Willems. NY: Hyperion Books for Children. I Want My Hat Back written and illus. by Jon Klassen. Somerville, Mass, Candlewick Press. Klassen's book is also on the 2012 Texas 2x2 Reading List! See Me Run written and illus. by Paul Meisel. NY: Holiday House. There are more awards and winners to explore that I couldn't possibly be able to include here! Please follow the links below to continue the exploration! The New Lunar New Year! Gung Hay Fat Choy! Chúc Năm Mới! Happy Lunar New Year! In celebration of the Lunar New Year (the first new moon of the year), here are some books that I recommend for reading! Bouchard, David. 1999. The Dragon New Year: A Chinese Legend. Illus. by Zhong-Yang Huang. Atlanta, GA: Peachtree. ISBN: 1561452106. Chinn, Karen. 1995. Sam and the Lucky Money. Illus. by Carnelius Van Wright and Ying-Hwa Hu. NY: Lee & Low Books, Inc. ISBN: 18800013x. Compestine, Ying Chang. 2006. D is for Dragon Dance. Illus. by Yongsheng Xuan. NY: Holiday House. ISBN: 0823418871. Compestine, Ying Chang. 2001. The Runaway Rice Cake. Illus. by Tungwai Chau. NY: Simon & Schuster Books for Young Readers. ISBN: 0689829728. Compestine, Ying Chang. 2011. The Runaway Wok: A Chinese New Year Tale. Illus. by Sebastia Serra. NY: Dutton Juvenile (Penguin). ISBN: 9780525420682. Katz, Karen. 2004. My First Chinese New Year. Illus. by Karen Katz. NY: Henry Holt and Company. ISBN: 0805070761. Klein, Adria F. 2007. Max Celebrates Chinese New Year. Illus. by Mernie Gallagher-Cole. ISBN: 9781404831476. Lin, Grace. 2008. Bringing in the New Year. Illus. by Grace Lin. NY: Alfred A. Knopf. ISBN: 9780375937453. Pham Viet Dinh. San Francisco, CA: Chronicle Books. ISBN: 0811834964. Wong, Janet. 2000. This Next New Year. Illus. by Yangsook Choi. NY: Frances Foster Books (Farrar, Straus and Giroux). ISBN: 0374355037. The year 2012 is the year of the Dragon! Try out these books! Kent, Jack. 1975. 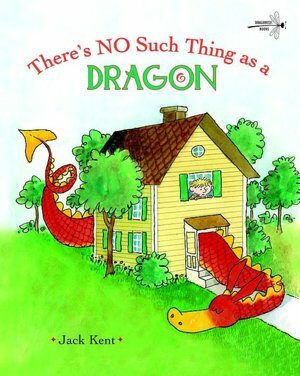 There's No Such Thing as a Dragon. Illus. by Jack Kent. 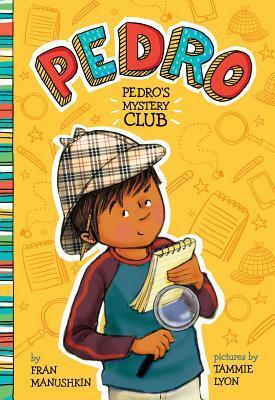 NY: Golden Books Publishing Company, Inc. ISBN: 0307102149. Schaefer, Carole Lexa. 2007. Dragon Dancing. Illus. by Pierr Morgan. NY: Viking (Penguin Group). ISBN: 9780670060849. Steckman, Elizabeth. 1997. Silk Peony, Parade Dragon. Illus. by Carol Inouye. Honesdale, Penn. : Caroline House (Boyds Mills Press, Inc). ISBN: 1563972336. Thong, Roseanne. 2001. Red is a Dragon: A Book of Colors. Illus. by Grace Lin. San Francisco, CA: Chronicle Books. ISBN: 0811831779. Smallcomb, Pam. 2011. I'm Not. Illus. by Robert Weinstock. NY: Schwartz & Wade. ISBN: 9780375861154. "She's not one single big ordinary. And she's a little mysterious." A shy girl says at the beginning of this story. According to her, her best friend and fellow scaly crocodile (or are they little dinosaurs? I'm going with crocs! ), Evelyn, can do anything. Evelyn is successful in quirky fashion, can tell amazing stories, is a decorator and artist extraordinaire, and so much more! All the while our nameless narrator says "I'm not.". However, one day she realizes that the things that Evelyn does not have the magic touch for, like spelling, karate and baking, she does has the touch for! The book ends with a perfect match of two friends, especially when they realize that Evelyn needs "A friend who is always by her side. Though thick and thin. A true-blue friend." and our own new crocodile friend yells, "I am! I am! I am!". To match the charming story is Weinstock's adorable illustrations detailing the differences between the two girls. If readers do not like crocodiles, wait till see these images! This is a amazingly great book to share with young readers (and even the adult readers) who are starting to notice the difference between them and others their age (friends and siblings alike!). This book will tell us all it is OK to be different and that opposites can make the best pair of friends (siblings) ever! Share the story with the readers then ask if they ever had felt the same the way before about a friend of a sibling. Have the children list out what they can do different than their friend, and why it makes them awesome too. Have the debate of whether the characters are crocodiles or dinosaurs! Have the children share what they would name the story's narrator. I had the great misfortune to overhear a staff member tell a mother and daughter that if they cannot find a poem for a middle school project they could try downstairs in the adult nonfiction collection! :: Stop aching my heart! :: What made it worse was the shelver knew I (the Children's Librarian) was there and had never refer the transaction to me; but that is beside the point here. There are many, many, MANY children's poets out there and many of their poems can be perfect for a school project! 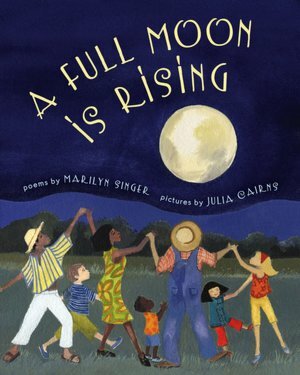 This poem, by the great Marilyn Singer, is from a collection of poems about the great orb in the night sky - the moon - as seen from around the world. Amazing work. This poem, and book, would be great for those in a Geography course or Multicultural course. ....as that jewel up high. ....from the mudflats to the sky. Can someone climb and pluck that gem? In the back of the book there is an explanation for each poem. Share the story behind the poem above. For those learning about Australia share this poem and its story then explore more about the pearls that comes from this little town. Have the children find something that makes their town/city/community unique and have them write a poem about the characteristic they picked. Singer, Marilyn. 2011. A Full Moon is Rising. Illus. by Julia Cairns. NY: Lee & Low Books Inc. ISBN: 9781600603648. Here's an great extra tidbit for you folks! It's the story behind the poem. I thought it was so nifty cool that I had to share it! I really want to see this phenomenon now! Broome, in the northwestern region of Australia, is a small town famous for its pearls and for a natural phenomenon called the Staircase to the Moon. Along Broome's coast are mudflats, lands that are left bare at low tides. When a full moon shines on the exposed mudflats, it creates the image of a staircase leading up to the moon through the sky. People from all over the world visit the town to view the "staircase," which can be seen for three nights each month from March to October. ~ Marilyn Singer, A Full Moon is Rising. It's finally here! Next to the Texas Bluebonnet Award, I :: HEART :: the Texas 2x2 Reading List. If you are already familiar with this list, skip the rest of this beginning paragraph and go straight to the list below! For those who don't know about the 2x2, let me share it with you! The 2x2 Reading List is created by Children's Round Table of the Texas Library Association, and provides 20 recommended books for children from age 2 up to 2nd Grade. 2x2, get it? I am quite excited to say that the majority of the books on this 2012 list were already on my list of favorite new books that my library now owns! Enjoy, folks! Ashman, Linda. 2011.No Dogs Allowed! Illus. by Kristin Sorra. NY: Sterling Children's Books. ISBN: 9781402758379. Beaumont, Karen. 2011. No Sleep for Sheep! Illus. by Jackie Urbanovic. NY: Harcourt. ISBN: 9780152049690. Chabon, Michael. 2011. The Astonishing Secret of Awesome Man. Illus. by Jake Parker. NY: Balzer + Bray. ISBN: 9780061914621. Crosby, Jeff. 2011. Wiener Wolf. Illus. by Jeff Crosby. NY: Disney Hyperion. ISBN: 97814234139836. Crum, Shutta. 2011. Mine! Illus. by Patrice Barton. NY: Alfred A. Knopf. ISBN: 9780375867118. Czekaj, Jef. 2011. Cat Secrets. Illus. by Jef Czekaj. NY: Balzer + Bray. ISBN: 978061920882. Ehlert, Lois. 2011. Rrralph. Illus. by Lois Ehlert. NY: Beach Lane. ISBN: 9781442413054. Gormley, Greg. 2011. Dog in Boots. Illus. Roberta Angaramo. NY: Holiday House. ISBN: 9780823423477. Hall, Michael. 2011.Perfect Square.Illus. by Michael Hall. NY: Greenwillow Books. ISBN: 9780061915130. Hoppe, Paul. 2011.The Woods. Illus. by Paul Hoppe. NY: Chronicle Books. ISBN: 9780811875479. Judge, Lita. 2011. Red Sled. Illus. by Lita Judge. NY: Atheneum. ISBN: 9781442420076. Klassen, Jon. 2011. I Want My Hat Back. Illus. by Jon Klassen. Somerville, Mass: Candlewick Press. ISBN: 9780763655983. Kosteciki-Shaw, Jenny Sue. 2011. Same, Same But Different. Illus. by Jenny Sue Kosteciki-Shaw. NY: Henry Holt. ISBN: 9780805089462. McDonnell, Patrick. 2011. Me... Jane. Illus. by Patrick McDonnell. NY: Little, Brown and Company. ISBN: 9780316045469. Neimann, Christoph. 2011. That's How! Illus. by Christoph Neimann. NY: Greenwillow Books. ISBN: 9780062019639. Ray, Mary Lyn. 2011. Stars. Illus. by Marla Frazee. NY: Beach Lane. ISBN: 9781442422490. Rinker, Sherri Duskey. 2011. Goodnight, Goodnight Construction Site. Illus. by Tom Lichtenheld. San Francisco, CA: Chronicle Books. ISBN: 9780811877824. Ricco, John. 2011. Blackout. Illus. by John Rocco. NY: Disney Hyperion. ISBN: 9781423121909. Stevens, April. 2011. Edwin Speaks Up. Illus. by Sophie Blackall. NY: Schwartz & Wade. ISBN: 9780375853371. Vamos, Samantha R. 2011. The Cazuela That the Farm Maiden Stirred. Illus. by Rafael Lopez. Watertown, MA: Charlesbridge. ISBN: 9781580892421.